Recent nationwide polls are reflecting the public's positive attitude towards and willingness to commit public funds to preschool, buoying grassroots efforts to bring quality preschool to every corner of the country. The poll results come on the heels of President Obama's "Preschool for All" initiative proposed earlier this year. The initiative would improve quality and expand access to preschool, through a partnership with all 50 states, by providing all low- and moderate-income 4-year-olds with high-quality preschool, while encouraging states to serve additional 4-year-olds from middle-class families. The seventh annual Education Next poll, or EdNext, released in August by the Harvard Program on Education Policy and Governance, found by a 60-27 percent margin the public supports "government paying tuition" for preschool programs. The EdNext results were based upon a nationally representative, stratified sample of 1,138 adults (age 18 years and older) and representative oversamples of the following subgroups: public school teachers, parents of school-age children, African Americans, and Hispanics. More than 75 percent of respondents favor a plan to use public funds to make preschool available to all 4- year-olds, according to the Associated Press-NORC Center for Public Affairs Research: Parents' Attitudes on the Quality of Education in the United States. 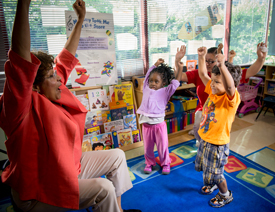 This report, also released in August, stated that 80 percent of respondents believe that preschool programs improve performance in later years. The Associated Press-NORC Center for Public Affairs Research results are based on a June national survey of 1,025 parents or guardians of children who completed kindergarten through grade 12 in the past school year. The 45th annual PDK/Gallup Poll of the Public's Attitudes Towards the Public Schools found that three of four Americans believe preschool programs for children from low-income households would help these same children perform better in school in their teenage years, and almost two of three Americans are willing to support these programs with taxes. Sixty-one percent of respondents rated investing in early childhood education as very important. The PDK/Gallup poll, released in August, is based on a nationally representative sample of 1,001 American adults, including a sub-sample of parents, who were interviewed by telephone in May. These three polls come on the heels of July's First Five Years Fund public opinion survey, in which voters throughout the United States ranked early childhood education as an "important national priority," second only to increasing jobs and economic growth. "The polls will help us in our efforts to educate policy makers. They show that with strong public support from voters, policy makers should feel at ease in voting for measures that support preschool," said James Lau, policy director at First 5 LA. First 5 LA has demonstrated a long-standing commitment to quality early childhood education through funding direct services (e.g., providing funding for nearly 11,000 preschoolers every year since 2005 in the Los Angeles Universal Preschool or LAUP program), investments in improving the early education workforce and ensuring that preschool programs are of high quality. In 2012-13 alone, First 5 LA invested over $64 million in programs to ensure that Los Angeles County's young children have a quality early education experience. The positive results of these polls regarding preschool programs also backed up long-held beliefs at LAUP, which will host the first Preschool Nation Summit on October 21 in Los Angeles to collaborate with local and national partners. This will be accompanied by a Preschool Nation website that will highlight major successes of investments in early childhood education, share insights, showcase activities and influence policymakers. "In California alone, there are hundreds of thousands of 3- and 4-year-olds not attending quality preschool programs, and here in Los Angeles County, more than 30,000 4-year-olds are not attending preschool this year," said Celia C. Ayala, chief executive officer of LAUP. "This is causing a disadvantage for children entering kindergarten because, as studies show, once a child starts school behind, it's likely they'll stay behind their whole academic career. We hope these polls prompt action in our nation to re-invest in our country's early education system because all children deserve a strong foundation to help them succeed in school and in life."